Do you think this crossing will now receive improvements after this incident. Trains stop on approach the level crossing and sound the horn before proceeding. Line speed is 10mph. The crossing MAY catch unsuspecting drivers unaware. The crossing is not illuminated as far as I’m aware. The area is treelined, the road itself is very narrow and steeply banked. There’s a sharp bend on each side of the crossing which would make speeding almost impossible. There’s not much you can realistically do to improve the crossing. 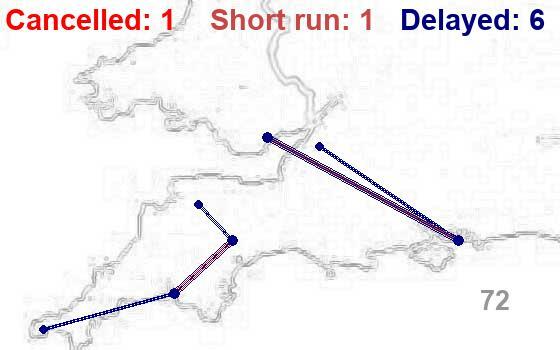 Yes, they were already planned for both the ungated crossings between Calstock and Gunnislake and also the two on the Looe branch, Lodge Farm and Terras Bridge. Half barriers, I think, but certainly budgeted for in the new Control Period. The picture indicates encroaching vegetation obscuring the view of the signage. In slightly different circumstances (vegetation alongside the track obscuring sightlines on an un-manned crossing), the Wensleydale Railway was fined for failing to control vegetation a few years ago. Here either the highway authority or Network Rail might be at risk of censure. Open level crossings without lights should not be regarded as prima facie dangerous - there are plenty in Europe, but signage should be adequate and kept unobscured. And the same goes for Brexit.